Early American-maple finished polywood. 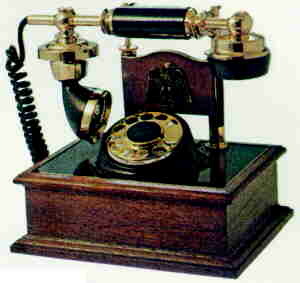 Charcaol handset and dial panel; eagle decoration; black cord. 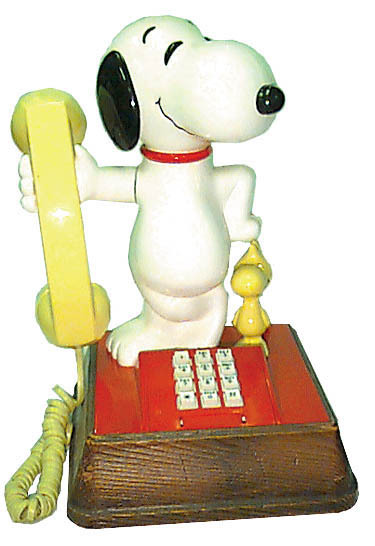 1970s Decorator cradle phone. Mediterranean; early American with eagle; maple leaf; or antique white. Brown marble look with gold trim and offwhite handst and dial panel. Green marble look with gold trim and off white handset and dial panel. Green marble look with gold trim and black handset and dial panel. Brocade-lipstick red. Padded panels of washable nylon flock pattern. White handset dial panel and cord. Cherub decoration. Blue/white figurine with gold trim. Caning pattern with gold trim. Off white handset and dial panel. Blue/white figurine. Grecian Cameo-white figures on blue. Off white handset and dial panel, white cord. Antique white-polywood. Off-white handset and dial panel. Cherub decoration; white cord. Comes in black with gold trim or white with gold trim. As is will have discoloration on brass handset parts. "As is" means as we get them, you get them, rusty, dirty, cruddy looking. You do the fixing up, cleaning up, repairing and make it work. Pink fabric with off white handset, black dial panel, and gold trim. ***We can do these in any color fabric. Gold brocade with cherub decoration in back panel. Red brocade with cherub decoration in back panel. Housings, only come in common colors like white, beige, gold, red, green, brown plastic. Rotary only. These do not include receiver elements. 1955 Ericofone; saves space. Swedish design; one unit with dial at bottom. Black(painted); red; gold; beige; tan; sandlewood; white and brown (painted). Add $15 for warbler on rotary ones. Sometimes comes in mint green; country blue; pink; ivory; and aqua. Chrome and 24 carat plated. Sometimes have other colors. Comes with ringer. Original ivory cord for 1955 Ericofone. Original Mickey Mouse with yellow handset and white cord. To add a lamp shade to your Mickey. Snoopy. Have only a few. To add a lamp shade to your Snoopy. ORIGINAL MICKEY MOUSE PHONE ARM. Replace your broken Mickey Mouse arm with this original unused one. Winnie the Pooh holding a butterfly. This is the older version. Rare collectible. To add a lamp shade to your Pooh. Touchtone sculpture or circle phone. Brown only. Sometimes white and yellow. Dawn or pancake phone. Brown; ivory; gray; green. Baroque Brass Coquette. Only one we have. Has ivory handle & caps. Comes with a little round ring on the back for picking up and carrying. Noteworthy. Corkboard on one side; a blackboard on the other. Tray on top holds pens; pencils; and chalk. Evan a space for your telephone book! 12-3/8X12-7/8". Rust (orange), yellow, or brown). Celebrity. Ivory trimmed in gold. Rotary dial. Coquette. French styling at an affordable price. White with gold trim. Rotary dial. Handset length is 9-1/2" long. 6-1/2"x7"x5-3/4" tall. As is in TT only. Sweet talk of Pillow talk phone. These are used phones. Restored to the best we can. Brass parts may show wear. Ivory, white, & gold. French mouthpiece for the 1970 and the newer style French phones. It is threaded on the small end and held in handset with a nut. The screw on cap on the end holds the T1 transmitter element in. MODEL DO-8 Telephone. Made in Japan. Sold through the Bell System in the 60s-70s French Style reproductions. Most have original cloth cords (which may have some discoloration and a pinstripe around the top). Ivory are with brass trim and a neat original dial. We restore these the best we can leaving the original paint, so there may be some scuffs and chipped paint. Style of cords and dials may vary. French Petite. Brass and chrome are with ivory handsets. 1970s Chest Phone. Cabinet is plastic wood grained. Please specify if as is for a dog scene one or a black simulated leather one. Stowaway. Contemporary oiled walnut or carved oak Mediterranean styling. Rotary or Touch-tone. Simulated walnut. Black simulated leather. Rotary dial and Touch-tone. 1960 AE spacesaver. Dial and hook are adjustable. Doesn't ring. Ivory; harvest gold; beige; black; and white. These usually came with a separate ringer box and often had matching colors. See ringer boxes RB14A. 1960 AE spacesaver. Dial and hook are adjustable. Painted pink, light green, & dark green. These usually came with a separate ringer box and often had matching colors. See ringer boxes RB14A. US made decorator candlestick wood grained; red; white; and black. Panel phone on various colors recesses into wall. Panel phone with 3" skirt around outside, chrome panel - rotary on/off switch for ringer. Genie phones. Brown or brown/white. Blue Genie Phone made by American Telecommunications Corp. Touch tone. 9"x3-3/4"x4-1/4" tall. Only have one of these. Peach Genie Phone made by American Telecommunications Corp. Touch tone. Red Genie Phone made by American Telecommunications Corp. Touch tone. Two tone red and ivory Genie Phone made by American Telecommunications Corp. Touch tone. 9"x3-3/4"x4-1/4" tall. Only have one of these. Gold toned Genie Phone made by American Telecommunications Corp. Touch tone. Red and pearl Genie phone. Blue and pearl Genie phone. Peach, brown and ivory Genie phone. A mixture of ivory and brown. Ivory on the top of the handset and leather on the underside, then brown on the upper part of base with ivory on the bottom side.